We at Gazettour think the best part of camping is the food. As a trailer-camping outdoorsman I like to keep my cooking easy, yes I said easy, but delicious enough to impress anybody around the campfire. Cast Iron cookware dates back to the seventh century. This type of cookware was on every chuck wagon in the old American West Utah went so far as to make it the states official cooking pot. This is an example of its history and place in the out of doors. Every time I cook with this famous cookware people are amazed and intimidated. Thinking that food will stick, or the pans are so hard to clean they would rather eat grilled food all trip long. I’m here to tell you it’s easy as pie. Cooking a baked chicken with all the sides and dessert is a walk in the woods. 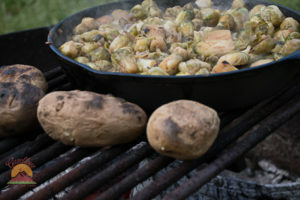 Gazettour also hopes by the time you finish this article you will be fired up to cook your way into your fire ring camping stories. In the following discussion, I will show you the easy way. We will not bore you with the oven’s and the pan’s anatomy. I recommend you get cookware that is the right size and can be stored easily in the sometimes small spaces available in camping life. I also strongly recommend using charcoal for your oven cooking. Charcoal is easy to control and much more economical and environmentally friendly than wood. Using a pan over the fire or an outdoor propane cooktop can provide fewer camper odors, easy cleanup, and no indoor mess. When buying a dutch oven I suggest buying an oven that has a rim on the cover and legs on the base. 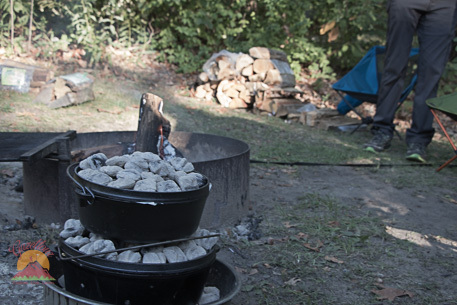 The rim provides a channel for setting coals. The legs give the coals space for more even heat distribution. As mentioned earlier get cookware you can store easily. To support oven and pans you will need a few accessories. I use a chicken feeder or another round high sided pan to place the oven and coals into while cooking. Keep in mind you coal pan needs to larger than your oven pan because your oven fits inside having plenty of room around its edges. This round dish not only provides a stable surface to set your oven in but a great place to start your coals too. You can get a feeder pan at most farm supply stores. A sturdy pair of high heat gloves is a must. I bought welding gloves. These work very well for both picking up and moving the cookware, but also in protecting your forearms from the surrounding sources of heat. Metal tongs are used to move and precisely place the coals on and around your cookware. Lid hooks are used to turn and remove the lids. A small hand-held whisk broom is needed to remove the coal dust off the lid prior to serving your dish. Cleanup is done by using coarse salt this process will be explained a bit later in this article. Parchment paper is needed as a liner to keep the food from sticking and helps with the cleanup. The first thing I’ll need to do is season your cast iron cookware. The easiest and cleanest way to do this is on the grill at home. After unpacking your new cookware, wash it in hot, mildly soapy water and rinse thoroughly, This will be the only time you will wash your cookware with soap. Washing with soap removes the season particles from the pores of the cast iron. I do it now to remove the manufacturing particles, oil, and dirt, from those pores and give us a fresh start or clean slate if you will. Once you wash, rinse, and dry your cookware cover surfaces thoroughly with cooking oil or grease (Crisco). Place all your grease covered cast pieces on a hot grill upside down and let all that good oil cook into the cast iron pores. You should not see any liquid grease pooled on any cookware surfaces. 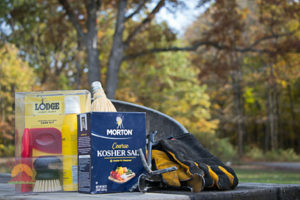 Seasoning completed when the surfaces stop smoking. Then you’re ready to cook. Prep your food the same as you would at home. In the dutch oven only, place the parchment paper inside as a liner. Finally, place your food in the dutch oven inside the parchment paper lining. Temperature Control: There have been studies on the number of coals you should use and the BTU (heat output) of each burning coal. In the spirit of truth and simplicity, all you need is a big pile of hot coals splitting the amount into halves. Half of the coals under your oven half on top of your oven. This technique is best when cooking chickens roasts etc. If you are baking a dessert, put more than more on the lid, less on the bottom. The only technique you need to know and perform is every 15 minutes or so lift and turn your over. By turning we mean rotating the base 90 degrees one direction then placing back on the coals, and turning the lid in the opposite direction 90 degrees. This makes for even cooking. If using the cast iron frying pan, cook as you would at home over the flame. Make sure you cook to proper temps or to you the chef’s liking and enjoy. Was that dinner good or what! Now we need to clean our cookware. Start by removing all the big stuff with a paper towel, and get the pans as clean as you can by just wiping out. Next scape off the crusties with whatever you have handy. When scraping off food, don’t worry about hurting your pans, just stay away from metal scouring pads. Finally, pour some hot water and the coarse salt inside, using a none metal scrub pad or brush, gently clean your cookware of the rest of the cooking debris. Rinse the salt out entirely with hot water only NO SOAP. Re-oil and reheat your pans in the fire you’ve made, a fresh hot bed of coals, or propane cooktop, until the surfaces stops smoking. I tried to make this easy and not too intimidating, and I hope we achieved our goal. After cooking with your new cookware, and using it as we suggested, you now know as I do it is easy but makes you look like a backwoods pro. Thanks for taking the time to read my post. I hope you have the confidence to cook in the tradition of centuries of travelers. This entry was posted in Our Gear. Bookmark the permalink.